12-30-17 - Episode 1 drops! Yay! Also to keep things rolling, the script for Episode 2 is finalized! 12-26-17 - Made the first of many "Meet The Bunnies" videos. More to come! 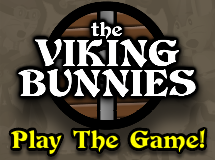 12-24-17 - The Viking Bunnies pilot episode is done! But, I'm still waiting until 1/1/18 to release it. 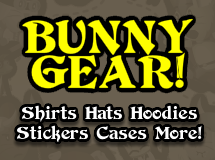 I will be working on a few promotional materials, a little more merch, and fixiing up the website a little more before the hordes of fans arrive. So many people! I also will be starting to write Episode 2. I have a lot of notes and gags I want to include, and the plot is based heavily on the original Book 2 plot from their old book series ... only now it's not for kids. 12-1-17 - Website and Patreon officially get going. 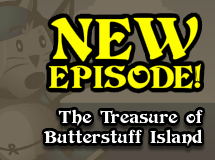 Episode 1: The Treasure of Butterstuff Island is about 25% complete. I'm liking it so far. It may be a bit long for an internet cartoon (roughly 15-minute estimate), but I don't care. I think people will enjoy it in its entirety. 11-22-17 - After creating the Teaser Trailer, the website has a 'soft opening'. Animation of the first episode and development of the mobile app are already well under way. More developments to come.